Thanks for visiting! We would LOVE for you to hang around! 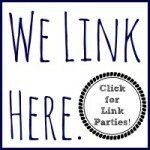 Like our facebook page, subscribe by email, or follow us on pinterest to be sure you don’t miss an update! Which means it’s time to plant. Nate and I both come from families who like to garden. Once school lets out, my parents (both teachers) spend the majority of their summer planting, weeding, harvesting, picking, baking, canning, and selling goodies from their small 30-acre farm. I’ve always enjoyed the (literal) fruits of their labors. A seemingly endless supply of fresh, Indiana watermelons? Gigantic pumpkins to carve at Halloween? Raspberry jelly made from the wild berries found in the woods? Yes, please! But I gained new appreciation for their hard work once our toddler started eating their homegrown goodies. She asked Papaw to plant pineapple and grapefruit. Sorry, kiddo! Not in Indiana. 2) I’m (kind of) okay with her eating unwashed veggies because I know how they were grown. I know that we don’t use pesticides or other chemicals. Homegrown garden vegetables and fruits are clean, fresh, and cheaper than organic foods purchased from the store. 3) Similarly, vegetables from your garden are real foods. They’re far from the packaged and processed snack foods we see on our shelves. Kids need to see that! I hope our kids will have a healthier relationship with food if they know where it comes from and see how it is grown. 4) Want to teach your kids about science? Grow a garden! There are tons of natural science lessons in the growing and planting process. This afternoon, my daughter and husband were hanging around the garden watching a little worm. From previous conversations, my two-year-old already knew that worms help the plants grow by helping air and water go into the soil. Similarly, my daughter has observed that our seeds have turned into sprouts/plants. In order for our plants to continue growing, our garden needs water and sunshine. If all goes well, we’ll soon have vegetables to eat. She’s learning cause and effect in a fun, non-threatening, and tasty way. 5) A garden teaches responsibility. 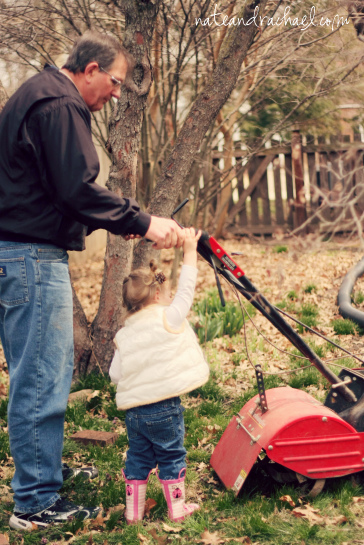 There’s work to be done in a garden and kids can help. What toddler wouldn’t love the invitation to turn over piles of dirt to prepare the garden for planting? An hour of planting seeds with Papaw is both fun and productive. When rain is scarce, our toddler helps us haul water to the garden in her tiny yellow watering can. Our toddler has invested in the garden. It’s hers. She’s helping it to grow. Okay, your turn! Do you have a garden? Have I convinced you to try? For more ideas, follow my gardening board on pinterest! Rachel – what a fun post. I haven’t tried gardening with my son, but I bet he’d love it. Especially the dirt part! Pinned. We’ve talked about starting a garden since our son’s first summer (he’s now almost 3) – hopefully we’ll get our butts in gear and make this year the year we actually do it! This is our second year of having a garden and I try to get the children out there at least once a day. It’s made huge changes to my little man and completely agree with you on the importance of encouraging children to get involved in gardening. 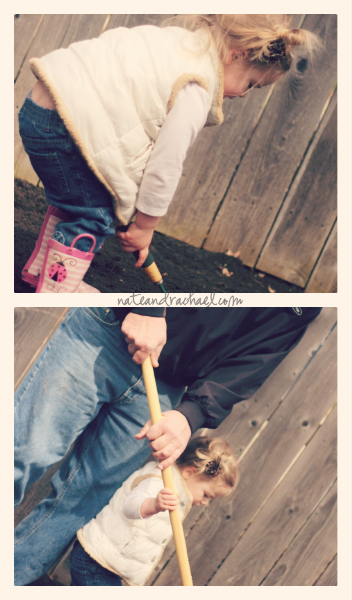 Thank you for linking up to Gardening Adventures. 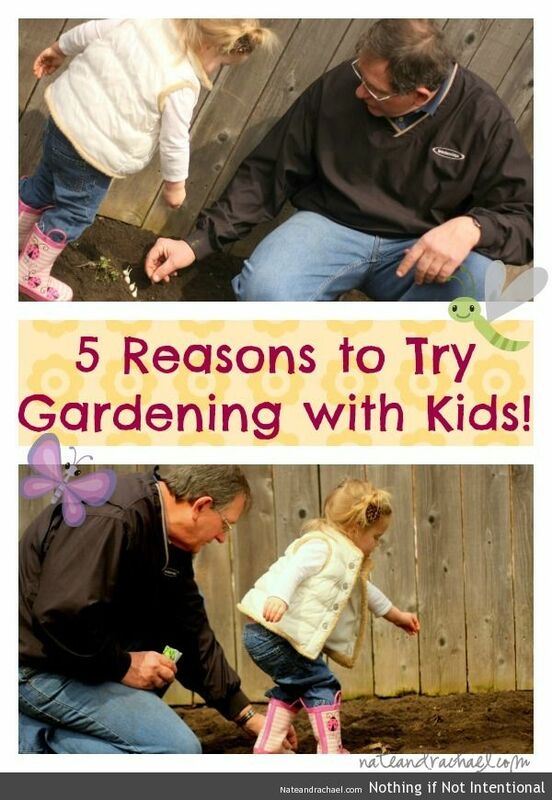 Excellent reasons to garden with kids – I especially love the connections to nature and science. 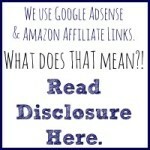 Thanks for sharing at the Discover & Explore linky this past week! I have never thought about how this would help picky eaters. I love your list of reasons to garden so much that I pinned this post. Thank you for linking this post up to the Dig Into Gardening Link Up.